Closed only on Christmas Day. Hours vary by season. Space Center Houston is a leading science and space learning center, the official visitor center of NASA Johnson Space Center in Houston and a Smithsonian Affiliate museum. The organization is owned and operated by the nonprofit Manned Spaceflight Education Foundation, a 501(c)(3) organization. The Johnson Space Center is the home of Mission Control and astronaut training. The center opened in 1992 and hosts more than 1 million visitors annually in its 250,000-square-foot educational complex. It is one of the top destinations in Houston holding the TripAdvisor Certificate of Excellence. The center holds over 400 space artifacts, permanent and traveling exhibits, attractions, live shows and theaters dedicated to preserving the history of America's human spaceflight program. It has a number of significant artifact galleries. The center has extensive STEM (science, technology, engineering and mathematics) education programs for all ages and draws more than 200,000 students and teachers each year. It annually generates a $73 million economic impact, 925 jobs and $36 million in personal income in greater Houston, according to a 2016 economic study by Jason Murasko and Stephen Cotten, associate professors of economics at the University of Houston–Clear Lake. These artifacts (except Skylab) were formerly housed in Johnson Space Center's former Visitor Center in Building 2. Space Center Houston is the home of the one-of-a-kind Independence Plaza exhibit complex. 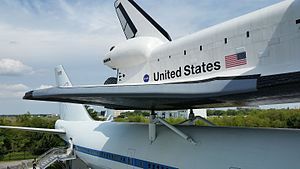 This landmark attraction is the world's only shuttle replica mounted on the original shuttle carrier aircraft and the only place where the public can enter both vehicles. The shuttle replica Independence, formerly known as Explorer, previously was located at Kennedy Space Center Visitor Complex but was moved to make way for a new permanent attraction hall for Space Shuttle Atlantis. Independence is now displayed atop the retired Shuttle Carrier Aircraft, NASA 905. On August 14, 2014, a heavy lift called The Rise of Independence was completed to place Independence on top of NASA 905. The plane was transported to Space Center Houston from Ellington Airport on April 30, 2014. The center opened the giant exhibit complex on January 23, 2016 at an estimated cost of US$15 million. The giant complex is the biggest project for Space Center Houston since opening in 1992. The first stage of this Saturn V rocket is from SA-514 (originally intended for the cancelled Apollo 19), the second stage from SA-515 (originally intended for the cancelled Apollo 20), and the third stage from SA-513, which was not needed after it was replaced by the Skylab workshop. SA-513 was originally scheduled for the cancelled Apollo 18 - the rest of the rocket was used for Skylab). The Apollo Command/Service Module CSM-115a (intended for Apollo 19) caps the pointy end. NASA displayed the restored Saturn V, on loan from the Smithsonian, outside from 1977 through 2004, when the Smithsonian took ownership. Grants from the National Park Service's Save America's Treasures program, the National Trust for Historic Preservation and private contributors funded the restoration. The exhibit Mission Mars opened in January 2017 and was developed with the help of NASA. It focuses on the work NASA is doing now to plan for future travel to Mars. Mission Mars teaches visitors about the planet through a variety of activities that transport them to the Martian landscape, including a virtual reality wall, real-time weather forecasts and a Mars meteorite that guests can touch. Visitors also can see a full-size Orion linkresearch capsule, experience an Orion spacecraft simulator and get a look at the next generation of Mars rovers. Space Center Theater is a five-story tall 4K resolution theater that shows EVA 23 and Mission Control: The Unsung Heroes of Apollo. The original shuttlecraft Galileo prop from Star Trek: The Original Series was unveiled July 31, 2013. The ultimate VIP tour is called the Level 9 Tour and is offered at an additional cost. It lasts approximately five hours and has a driver and personal guide to visit all of the above buildings and other areas such as the Neutral Buoyancy Lab, the Space Vehicle Mockup Facility and International Space Station museum. The lectern that President John F. Kennedy used during his 1962 Rice University speech announcing his goal to land an American on the Moon in the 1960s is exhibited inside Destiny Theater. Destiny Theater has a high-definition digital screen and shows a short historical film, Human Destiny, produced by Bob Rogers (designer) and BRC Imagination Arts. The live interactive performance Living in Space, produced by Bob Rogers (designer) and BRC Imagination Arts, employs high-tech projection mapping technology to assist with the live onstage educational presentation of daily life on the International Space Station. A Stellar Science Show is a live program that lets guests become rocket scientists through interactive experiments performed by a center Crew Member. Mission Briefing Center features live presentations offering real-time updates on current NASA missions. The center offers an opportunity to have "Lunch with an Astronaut" for an extra cost. Astronaut Gallery showcases a comprehensive collection of spacesuits, including Pete Conrad's Apollo 12 moonwalk suit. International Space Station Gallery provides a look inside the space station – from interactive live shows to a Robonaut and actual flown space station artifacts. Talon Park has a pair of NASA T-38 Talon jets greeting visitors at the street entrance to the Space Center Houston campus. Wikimedia Commons has media related to Space Center Houston. ^ "MSEFI History". Manned Spaceflight Educational Foundation Incorporated. Archived from the original on December 23, 2010. ^ "Foundation History". Space Center Houston. Retrieved January 22, 2018. ^ a b Space Center Houston Official Souvenir Book. AeroGraphics, Inc. 2016. pp. 22–28. ^ "Space Center Houston steels itself for NASA 905's 'Big Move'". SpaceFlight Insider. April 28, 2014. Retrieved May 28, 2014. ^ Rice, Harvey (August 14, 2014). "Shuttle replica makes final landing atop 747 at Space Center Houston". Houston Chronicle. Retrieved August 15, 2014. ^ "Space Shuttle Carrier to be Museum Piece". The Courier. Associated Press. April 28, 2014. Retrieved August 15, 2014. ^ Gerard, Jim. "A Field Guide to American Spacecraft". www.americanspacecraft.com. Retrieved January 22, 2018. ^ "Restoration Begins on Saturn V at JSC". NASA. ^ "Space Center Houston Premieres Updated "Human Destiny"". NASA. June 28, 2012. ^ "Space Center Houston: Living in Space" (PDF). BRC Imagination Arts. Archived from the original (PDF) on December 24, 2013. ^ "The Feel of Space". Space Center Houston. Archived from the original on June 11, 2013.